Successfully Added Automatic Soap Dispenser to your Shopping Cart. 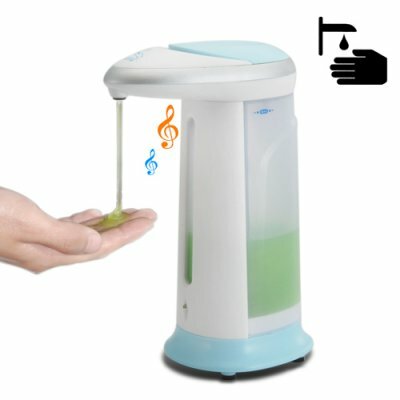 Automatic Soap Dispenser to keep hands clean with the convenience of never having to touch anything to promote a germ free environment and keep your hands clean, body healthy. You wash your hands to get rid of germs and bacteria, so why risk touching a soap dispenser that sits out all day being touched by dirty hands? This automatic soap dispenser has a built-in infrared smart sensor which provides a safe and germ-free way to dispense liquid soap, detergent, lotion, or anti-bacterial gel with just a wave of your hand. This device is designed to dispense the exact amount of soap needed and along with no-drip innovation, you can eliminate both waste and counter-top messes. If you are serious about your health, then getting a hands-free soap dispenser is a must. Studies have shown that regularly washing your hands help to reduce the chances of catching common illnesses. Keep an automatic soap dispenser wherever you are and ask establishments to do the same; They are ideal for: homes, offices, hospitals, kitchens, bathrooms, restaurants, bars, hotels, private clinics, public bathrooms, and clubs. Washing your hands on a regular basis is essential in preventing the spread of germs and infections, which is why the CVSB-H36 automatic soap dispenser is an excellent investment. An extra-large soap reservoir capacity of 400 mL also means more uses and fewer refills, making this convenient to use in homes with constantly messy children to even the busiest business establishments. Along with our factory-direct price and 12 month warranty, you won't find a better deal anywhere else - buy one to test and then purchase in bulk to make some serious profit for your online store. Order today and we'll ship it out to you tomorrow, brought to you by the leader in Wholesale Electronics - Chinavasion. Will this product help prevent H1N1, SAR's, etc? Washing your hands after handling public space items such as door knobs, elevator buttons, etc. is a certain way to help prevent the spread of germs. Doctors recommend washing your hands regularly to help prevent catching the common cold and flu when working in large public offices. This automatic soap dispenser isn't dispensing enough soap... what's wrong? Some thicker liquids may be need to be thinned to accommodate the dispenser. Make sure that your soft soap is dispenser friendly. For extra thick soap or cleaning liquids you may try adding some water to the bottom of the dispenser before adding the soap into it. ótimo..design moderno, e funciona muito bem!! It uses an ir transmitter and receiver, break the line of sight and it dispenses soap, that's about it, great price and it works. Hope it will be available in various colours as well. I receive it very soon...nice and clever device.